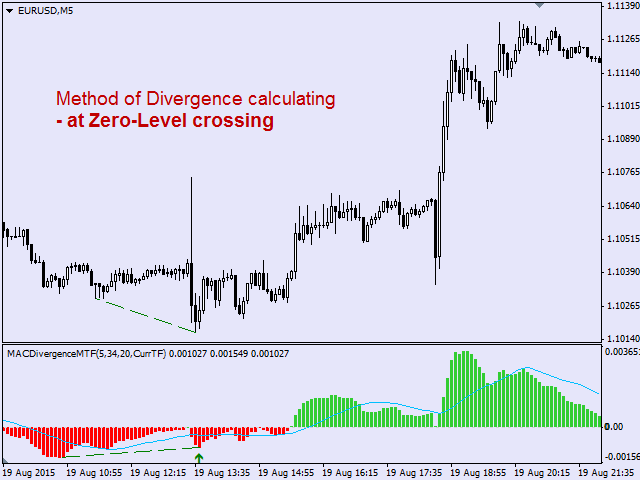 It detects and displays classic and reverse divergences (two methods of detecting divergences). It uses different color to highlight an uptrend and a downtrend. Two methods of determining a trend: а) MACD crosses the 0 level (classic signal); б) MACD crosses its own average (early signal). 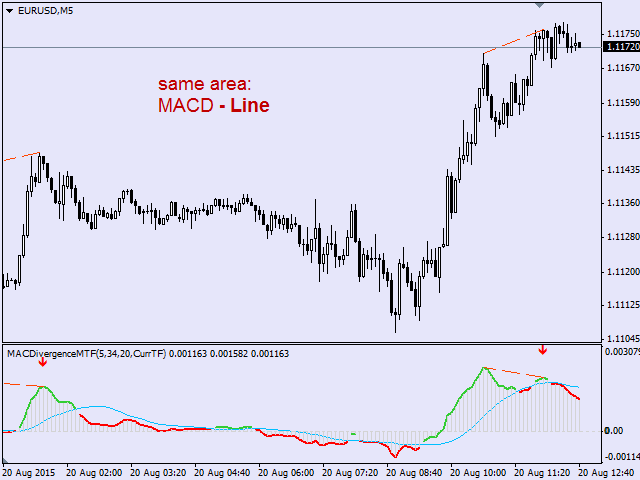 This is a multi-timeframe indicator: it can display MACD data from other timeframes. Two methods of drawing: classic histogram and line. It generates sound and visual signals when the trend is changed and the divergence is formed. It sends emails and push-notifications to mobile devices. The indicator is fully functional on NZDUSD (history + real time operation). Signals on other instruments can be seen on the history (after 10 bars from the current one). Fast EMA period - fast EMA period. Slow EMA period - slow EMA period. Signal Line period - signal line period. Shift relative to the current TimeFrame (can be >0, <0, =0) - shift of the timeframe relatively to the current TF. 1 means higher by 1, 2 - higher by 2. -1 means lower by 1 period etc. For example, when the current period is M15, if you set the parameter to 1, the indicator will display MACD data on M30, and if you set it to -1, the indicator will display MACD data on M5. The style of drawing MACD - way of drawing MACD (histogram or line). 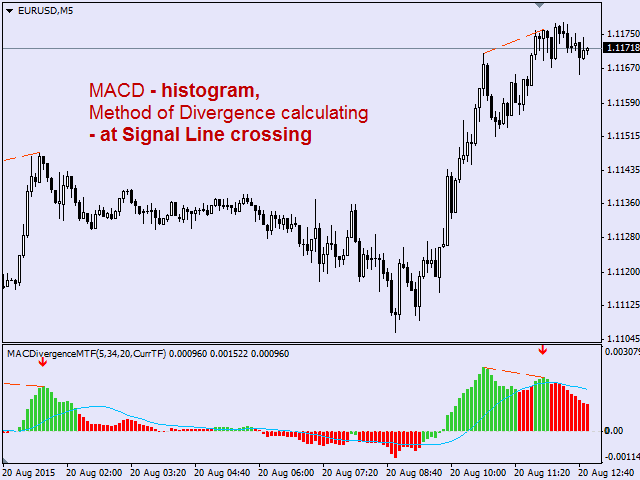 MACD color change and Method of Divergence calculating - methods of determining a trend (MACD changes color) and detecting divergences (crossing the zero level (classic method) or crossing the signal line (earlier signal). at Signal Line crossing - MACD and signal line crossing (optimal version) - accurate signals with a small delay. Draw Divergence Lines in indicator's subwindow - if allowed, divergences will be also displayed as lines in the indicator's window (complementary to signal arrows). Draw Divergence Lines in chart window - displaying divergence lines in the main window. Classic Divergence line style - style of classic divergence lines. Reverse Divergence line style - style of reverse divergence lines. Classic Bullish Divergence color - color of classic bullish divergence. Classic Bearish Divergence color - color of classic bearish divergence. Reverse Bullish Divergence color - color of reverse bullish divergence. Reverse Bearish Divergence color - color of reverse bearishClassic Bearish Divergence color - color of classic bearish divergence. divergence. Signal when the MACD changes color – name of the sound file played when the trend is changed (MACD changes color). 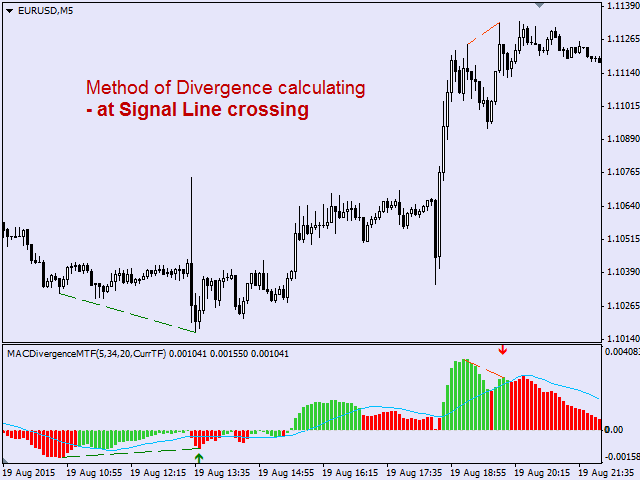 Signal when the Divergence formed – name of the sound file played when divergence is formed. Added the divergence calculation method offered by Elder in his book "The Strongest Signal in Technical Analysis" (MACD and 0 crossing, the end of a peak/bottom is a bar following the extremum). Signals are activated earlier as compared to the standard MACD and 0 crossing, but the number of false ones is increased. 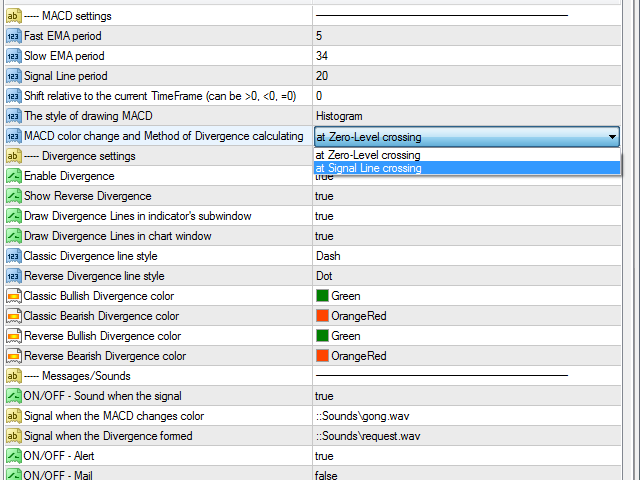 Replaced "Enable Divergence" parameter (enable/disable all Divergence signals) with "Show Classic Divergence". 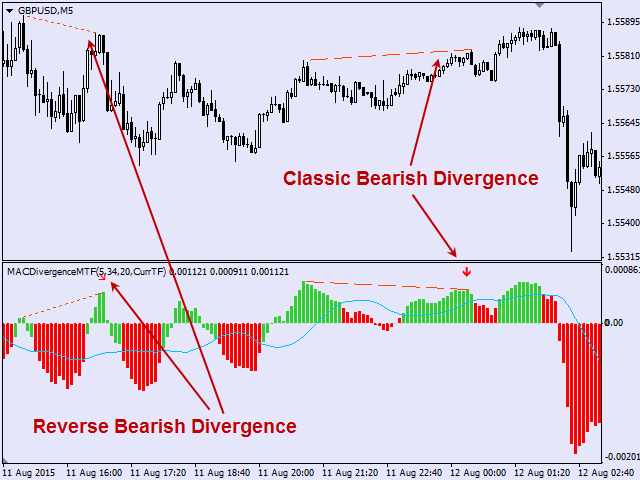 Thus, now the indicator can display Classic and Reverse Divergences separately using "Show Classic Divergence" and "Show Reverse Divergence" parameters. 1. Added optional parameter "Enable the Message about changing color of the MACD", which enables/disables generation of the message about the trend change when the MACD crosses the zero line or the signal line. 2. Many trades were confused with the indicator drawing signal arrows at the peak of MACD, and the signal itself being formed a bit late, when the formation of this peak was over. I.e. the signal arrow was drawn "retroactively" compared to the time when the signal occurred. 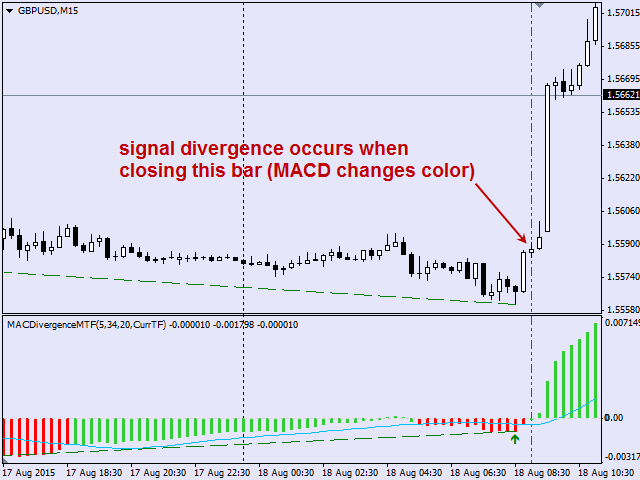 In this version, the divergence arrows are moved from the MACD peak to the bar the signal appeared on.